a very few large plants available at present. 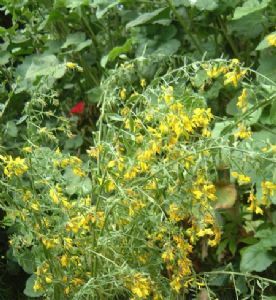 Dyer's greenweed is a low shrub, resembling a miniature broom bush, with dense spires of golden yellow, pea-like flowers clustered near the top of the stems. It is a spreading plant with oblong, lance-like, light green, pointed leaves. In the autumn it produces flat, blunt, hairless pods containing the seeds. It is usually found on lightly-grazed grasslands on chalk or limestone, or slightly acidic clays. Dyer's greenweed is a warmth-loving plant that requires sunlight. It is susceptible to frosts.